A lush landscape of swampy cypress provides an ideal backdrop for this peaceful scene. Jeffries Creek Nature Park is 55 acres of wetland close to downtown Florence. 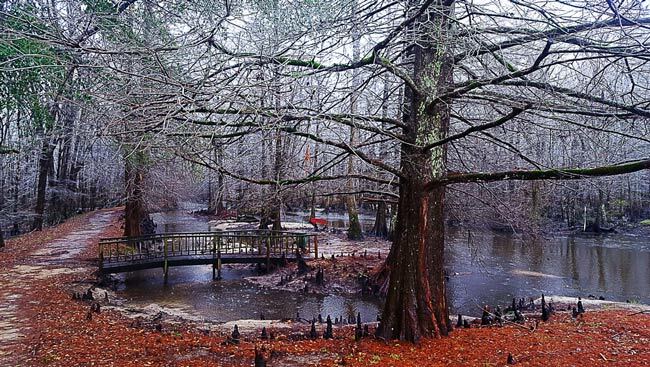 The park has a trail that follows the creek through a swamp of cypress trees. 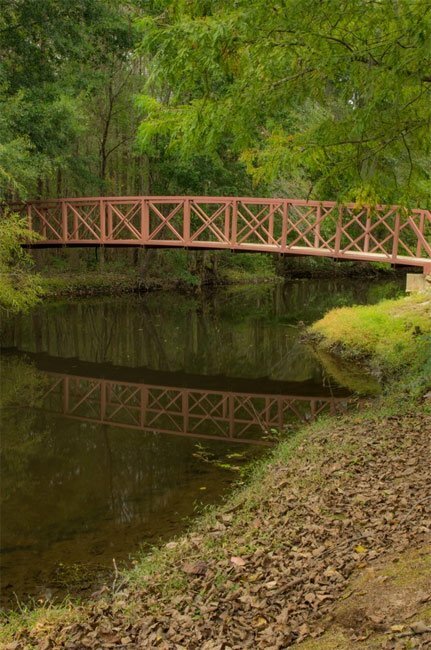 Jeffries Creek is the largest watershed and wetlands area in the Pee Dee region. A subdivision surrounds the park, and the creek is currently vulnerable to pollution due to adjacent development. The park’s namesake channel, Jeffries Creek, is a blackwater creek that winds through both Darlington and Florence counties. The creek begins just below Hartsville and flows through Florence. It is a tributary of the Great Pee Dee River. The infamous Florence Stockade, a Civil War prison camp, was built along Jeffries Creek to contain Union prisoners of war. The camp’s location was chosen due to its proximity to the railroad and because Confederate officers believed the region to be safe from General Sherman’s army. In fact, many Union prisoners from Georgia’s Andersonville prison – formally known as Camp Sumter – were transferred to the Florence Stockade during General Sherman’ March to the Sea. A rectangular outdoor prison fortified with palisades on earthen walls, the camp was designed after Andersonville prison. Conditions at the Florence Stockade were deplorable, leaving many prisoners to die. Several Union prisoners from the Florence Stockade are buried within Florence National Cemetery. From the Index to Grants, South Carolina Archives, we learn that on October 7, 1762, John LOVELESS, a merchant trader on the Pee Dee, was granted 50 acres on Jeffrey’s Creek, which flows into the Pee Dee River. John LOVELESS lived at Winyaw plantation. Judgement Rolls, 1762, No. 109A, South Carolina Archives. Source: The Papers of Henry Laurens: Vol. 5, Sept. 1, 1765-July 31, 1768. P:301. Yes, Joy! It is different, for sure. And oh so beautiful! Jeffries Creek! Can you believe it? Park and Preservation project. Not the Jeffries creek I remember but sure brought back fun memories. Thanks Marilyn. I had mine there and it was beautiful!